Behind every historic building and home within the Ann Arbor community, is a story to tell. Whether it’s based on the city’s earliest residents or on the community’s growth over the years, the neighborhood’s value, beauty and culture still remain. Ann Arbor’s development for economic goals and growth management have expanded over the course of time. Things such as property, beautiful landscapes give this city a sense of place. We build Trex decks in Ann Arbor that accentuate both historic homes and new buildings. In Ann Arbor, low-maintenance, composite decks are becoming more popular. Many of the older neighborhoods are wooded and a Trex deck requires less maintenance than wood decks. Trex decking offers fine looks of natural wood without worrying about the cracks, splits and warps that a traditional deck may bring. The building materials that are used for low-maintenance Trex decking are manufactured from a mixture of recycled materials (plastic and wood fibers). The Trex Decks we build includes a full line of different grain patterns and colors. 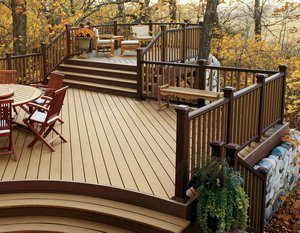 As a certified Trex Platinum Contractor, Miles Bradley professional deck builders visit your residence in Ann Arbor and give you a competitive quote right there. We even have special offers you can take advantage of. Providing both exceptional workmanship and quality materials, we are highly experienced master carpenters. Whatever you want, we got it. Deck lights, accessories, built-in hot tubs…the list seriously goes on! In Ann Arbor, quite a few residence use their decks for leisure and buy hot tubs to enhance their experience. Miles Bradley will design your new Trex deck to accommodate a hot tub, gazebo or any custom building you require. If you’re looking for a deck building contractor in the Ann Arbor area, please do not hesitate to call us at 248-478-8660 or fill out our quote form. We build Trex decks in Detroit and Chicago Metro Areas and look forward to talking with you!